The Main Theater stood in the place of today’s Bank of Spain until its demolition at the beginning of the 30’s. It was the only place for spectacles that Guadalajara had in the period before the beginning of Comical Theater in 1911. In 1897, when the projection of movies started, the tenant was the piano musician, seller and tuner Ezequiel Castelló. 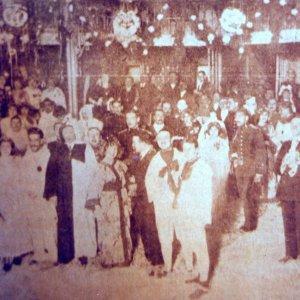 We present here the oldest picture found until today indoors the mentioned theater; it was taken in 1914 during a carnival dance.